How Does the BMW i8 Get Superior Fuel Mileage? The BMW i8 Series of vehicles looks and acts like a sports car, no matter if they come in the coupe or the roadster form. 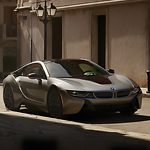 Like other hybrids, the BMW i8 is powered by both a gasoline and an electric motor. Unlike other hybrids, the BMW i8 does not hold back in the performance department with the coupe achieving zero to 60 acceleration in 4.2 seconds and the roadster reaching 60 mph in 4.4 seconds. Though the i8 is designated as a rear-wheel-drive vehicle, in actuality it works as an all-wheel-drive unit. The 1.5-Liter, inline three-cylinder motor delivers 231-horsepower to the rear wheels while the 11.6-kWh electric motor delivers 143-horsepower to the front wheels bringing a total of 374-horsepower in Shelby Township and out. By visiting BMW of Rochester Hills, you can discover this 60-mpg car for yourself with a view and a test-drive down the highway.